/Assigned Seating /How does assigned seating work with Purplepass? Purple pass offers an assigned seating feature where your ticket buyers will be able to select their own seats on an interactive map. Any maps that are created for you will be under “My Venues”. Here will be all the master templates for your account. NOTE: Any edits done here will only reflect on new events that it is added to. If you have no maps yet, don’t worry. You can do it the easy way and contact your service rep, our customer support at support@purplepass.com or call 1-800-316-8559. You can also create your own map, however, we recommend calling us up first for a demo since the map editor has a learning curve. If you choose to have us take care of it, our Purplepass staff will create your seating map at no extra cost. All you need to do is give your service rep a picture of the seating assignments with any special notes and they will take care of the rest. 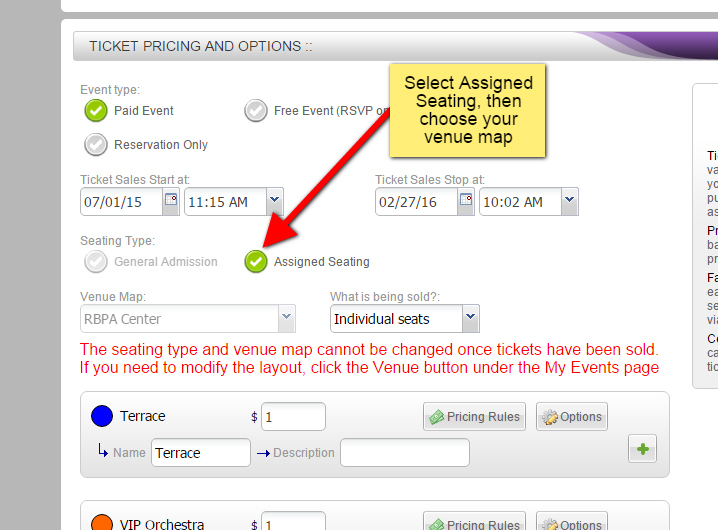 When you are creating a new event you will be able to add a map to it by making it an “Assigned Seating” event. Once this is selected you will find a drop down with a listing of your available venue maps.